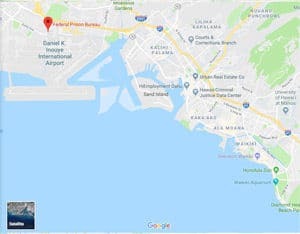 Location: FDC Honolulu is located adjacent to Honolulu International Airport on the Hawaiian Airlines side. Background: FDC Honolulu was opened in 2001. It houses pre-trial detainees and holdover inmates within its 12-story structure. Notable inmates include stars of the TV reality show Dog The Bounty Hunter Duane “Dog” Chapman, Leland Chapman, and Tim Chapman (arrested on September 14, 2006 for an illegal bounty hunting warrant, all released the next day). Health Services: Health services at FDC Honolulu include sick call, emergency care, medications, chronic care management, routine dental care, medical and dental emergency care for injuries and sudden illness, age-appropriate preventive care to promote optimal health and functional status, restorative care to promote achievable functional status, long-term care, and end-of-life care. Emergency medical services are available 24 hours a day. Psychology Services: FDC Honolulu’s psychological services include screening, assessment, and treatment of mental health issues, individual and group counseling, psycho-educational classes, self-help and supportive services, and referral to Health Services for medical treatment of a mental illness. Inmates can request program placement by submitting an Inmate Request to Staff form. Residential Drug Abuse Program (RDAP): FDC Honolulu does not house a Residential Drug Abuse Program (RDAP), but referrals can be made to institutions which do provide RDAP. A Drug Abuse Education Course and the Non-Residential Drug Abuse Treatment Program (NR-DAP) are available. Education Services: FDC Honolulu provides literacy, GED, and English-as-a-Second Language (ESL) programs. Incentive awards are provided to recognize inmates making satisfactory progress and successfully completing the literacy (i.e., GED and ESL) program. Inmates may also receive incentives for progressing to various levels in the GED or ESL programs. Graduation ceremonies recognize GED, ESL, and Occupational Education completions. High school diplomas and post-secondary programs are available through paid correspondence programs. Advanced Occupational Education: FDC Honolulu does not offer any advanced occupational education programs. Vocational Training: FDC Honolulu does not offer any vocational training programs. Apprenticeship: FDC Honolulu does not offer any apprenticeship programs. Library Services: Leisure libraries offer inmates a variety of reading materials, including periodicals, newspapers, fiction, nonfiction, and reference books. Institutions also participate in an interlibrary loan program with local, state, and college libraries and available bookmobile services. Inmates are also afforded access to legal materials and an opportunity to prepare legal documents with the assistance of the TRULINCS Electronic Law Library. Resources are available for inmates to purchase legal material via Trust Fund. UNICOR: FDC Honolulu does not house a UNICOR facility. Commissary: The monthly spending limit is $360.00. Inmates are allowed to shop once a week on their designated shopping day. Inmates may use funds in their account to purchase items at the institution commissary, place funds on their inmate phone account, purchase TRU-Units for their TRULINCS account, or otherwise send funds. Inmates are allowed to purchase a wide variety of products. Recreation Services: FDC Honolulu offers recreation, leisure, wellness, and social programs. Leisure activities include organized and informal games, sports, physical fitness, table games, hobbycrafts, music programs, intramural activities, social and cultural organizations, and movies. Art activities include all painting and sketching rendered in any of the usual media (e.g., oils, pastels, crayons, pencils, inks, and charcoal). Hobbycraft activities include ceramics, leatherwork, models, clay, mosaics, crochet, knitting, sculptures, woodworking, and lapidary.